It’s hard to imagine Edinburgh without its Christmas lights and festive markets at this time of year, but until quite recently Christmas was just an ordinary working day for Scots – Hogmanay quickly became the time to celebrate! 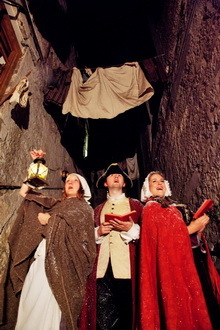 Edinburgh’s famous underground attraction, The Real Mary King’s Close, is revealing some of the city’s hidden history surrounding Christmas and New Year in new extended festive tours on Friday, Saturday and Sunday evenings throughout December. Edinburgh is known as the world’s original New Year Party, hosting one of the biggest street party celebrations in the world with over 80,000 revellers, but the popularity of Hogmanay stems largely from the outlawing of Christmas in 1575. People were banned from celebrating Christmas, so many traditions were moved to the New Year. Modest New Year celebrations soon became an explosive street festival and people were so enthusiastic about welcoming in the New Year that the events continued into 2 January, which is the reason this day is still a holiday in Edinburgh today. Previous PostPrevious 17th century ‘hand-fasting’ to celebrate Royal wedding at The Real Mary Kings Close!